It was quite possibly the first successful river crossing in a Lamborghini in decades. Not that others haven’t tried. Plenty of curious things, we imagine, have happened in Lambo’s road cars. And certainly someone forded a river in an LM002, back when the Rambo Lambo was fresh. But this was different. This Lamborghini, the Urus, isn’t a devoted exotic. And it isn’t a sworn off-roader. It’s neither, and yet it’s both. We went to Iceland to get familiar with the brand’s second-ever SUV and to see if Lamborghini’s carbuilding talents extend beyond its glittering wedges of decadent speed. Besides the fact that Iceland has cornered the market on consonants, here’s what you need to know about the island nation: It’s relatively small—less than half the size of Wyoming. It’s also not very tall. The highest peak is Hvannadalshnúkur, which stands at 6920 feet on the northwestern rim of the Öræfajökull volcano. By American geographical standards, these are blips. But spend much time in Iceland’s backcountry and you immediately sense its intolerance for fools. Make a bad choice here and nature will make you regret it. Nothing is likely to eat you, though the occasional polar bear does find its way across the Atlantic on ice chunks from Greenland. Instead, you’ll die of exposure, probably from freezing rain, Iceland’s preferred form of precipitation in the fall and spring. But if you’ve ventured inland enough, into the highlands as we planned to do, there’s snow. Lots and lots of vertigo-inducing whiteout snow. So when I explained our plan to drive this quarter-million-dollar SUV to the center of the island in mid-October, a local guide looked at me like I had eaten one too many puffins. Iceland, after all, is the spiritual home, if not the actual origin, of the snow-going trucks the locals call superjeeps. These are Toyotas, Land Rovers, and other 4x4s—oddly, very infrequently actual Jeeps—fitted with heavier axles and tall, wide tires that float over snow. They carry tourists to the island’s interior, protecting the heedless from themselves, mostly. Superjeeps are made for the glaciers and bogs found in the Icelandic highlands. And this Urus, with its 22-inch wheels and 40-series front and 35-series rear tires, is not a superjeep. The Urus is also not a purebred Italian. It shares its Volkswagen MLB Evo platform with the Audi Q7and Q8, the Bentley Bentayga, and the Porsche Cayenne. Its engine, a 641-hp twin-turbo 4.0-liter V-8, is German, too, and is also found in lower-output spec in the Panamera Turbo and Cayenne Turbo. An eight-speed ZF automatic transmission sends torque to a Torsen center differential that directs rearward twist to an electronically controlled torque-vectoring diff. The open front differential is the only significant piece of the chassis or powertrain not beholden to some form of electronic control. There are air springs at all four corners that change the Urus’s height with drive modes. Active anti-roll bars secure body roll on-road and can fully decouple in the off-road modes—Sabbia (sand) and Terra (gravel)—and the rear-axle steering yields nimbler turning or more stability, depending on vehicle speed and drive mode. Simple the Urus is not. Carbon-ceramic brakes are standard equipment, and wheel sizes range from 21 to 23 inches. Both Uruses (Uri?) we drove, this one in Iceland and another in California to gather test numbers, were fitted with 22-inch wheels. The Iceland car used Pirelli Scorpion Winter tires and the California car was fitted with Pirelli P Zero summers. Along the west coast of the island, the landscape was brown, a sure sign that the cold, dark hand of winter was tightening its grip. Beams of sunlight sporadically cleaved through vanilla clouds, but the rain came in blankets rather than sheets. With a plan to barnstorm as deep into the Icelandic highlands as the Urus could take us, we headed southeast from Reykjavík on Route 1 then turned northeast on Route 35, also known as Biskupstungnabraut, where we chased rainbows along the near-vertical face of Ingólfsfjall mountain. This was our road, the reason we came to Iceland. Farther inland, where it climbs past a clearly delineated snow line, Route 35 bisects the island’s second- and third-largest glaciers. That sprawling emptiness was our goal, but first we needed to feel out the Urus on tarmac. Gullfoss waterfall, along Route 35, marks the end of the road for tourists this late in the year. At least it’s a worthy end, with the Ölfusá (a.k.a. Hvítá) river plunging 105 feet over two drops. We stop at Gullfoss to gird ourselves with outerwear worthy of the highlands ahead. Mercifully, the Urus is no Aventador, and as we shuffle through the bottlenecked crowds, only the cognoscenti notice it. This is the introvert’s Lambo—the one that doesn’t turn every fuel stop into a circus. Its V-8 barks to life with a bit of theater, but the engine vanishes into the German stoicism that overarches the Urus’s Strada (street) mode at cruising speeds. Photographer Charlie Magee observes that the Urus feels more Audi than Lamborghini at this pace. As we roll out of Gullfoss, we pass a sign banning two-wheel-drive vehicles in the highlands and, later, another saying the terrain is impassable. We exchange no words. Just then, the road becomes awesome, bending to fit the terrain through a high-speed maze of paved perfection. The Italian in the Urus reveals itself. Sport mode lowers the ute 0.6 inch and sharpens its responses to inputs. The engine is Herculean. There’s massive, usable torque as low as 2250 rpm and substantive yank until the 6000-rpm horsepower peak. Body roll, at least at the limits allowed by the winter tires, doesn’t exist, and the fixed-ratio steering is reliable and accurate. Back in California, we later discover a 1.02-g skidpad average, which is better than every supersedan’s in our last comparo. And that’s on the P Zeros. Stickier Corsa rubber is optional. The following miles prove the Urus’s on-road grit as we shriek toward the highlands on sodden roads in temperatures that hover just above freezing. This is a fast, capable road vehicle, one that burnishes Lamborghini’s ability to create an alluring driver’s car, even when it starts with imported hardware. That it has four seats (five are available, as equipped on our California test vehicle) and real cargo space is just gravy. We unravel several more miles of asphalt road before cresting a hill and saying goodbye to pavement. Near here, Route 35 changes names from Biskupstungnabraut to Kjalvegur. And Kjalvegur brings us one layer closer to Iceland’s true character. Though it’s a maintained road rather than a two-track, it’s essentially no different now than it was in 1898 when it was first marked by cairns. Today, Kjalvegur is outlined with posts, but only on one side and with a consistency that begets a lack of confidence in snowbound route finding. And calling it “maintained” is to pay this byway a healthy compliment. Most of the large boulders have been pushed off the path, but this volcanic-rock route has the stark look of a road traversing the Sea of Tranquility. Indeed, although we just left a roiling trap of humanity 10 miles earlier, the place feels as remote as a moon crater. Moments later, after we cross another valley, the snow starts, lightly at first and then with fervor. We ascend lazily, about 1000 feet over a few miles, but it’s enough to turn the sopping rain into a whiteout that has photo man Magee walking in front of the Urus to guide us and give direction in the flat light. Wind has drifted the snow to depths that require max-lift mode, which raises the Urus three inches above its default ride height. The challenge is real now, and the Urus has yet to show any sign of backing down. At the high point, near Bláfell, we’re not even 2200 feet above sea level, but we might as well be lost in the Karakorum. Our support vehicle, manned by Lamborghini test driver Mario Fasanetto, is a Volkswagen Amarok pickup fitted with studded winter tires. The extent of our recovery gear is a tow rope—dráttartógin Icelandic—purchased at a convenience store after leaving Reykjavík, and exactly two arctic-tire-equipped trucks have shared the road with us in the past four hours. Langjökull glacier, were we able to see it, is about six miles west, and Hofsjökull glacier lurks some 15 miles to the northeast. It feels lonely here because it is. We’ve witnessed, in a single day, the wide scope of the Urus’s talents. Equally at home scything through 100-mph sweepers and carving apart a snow-covered Icelandic moonscape, the thing is hauntingly gifted. 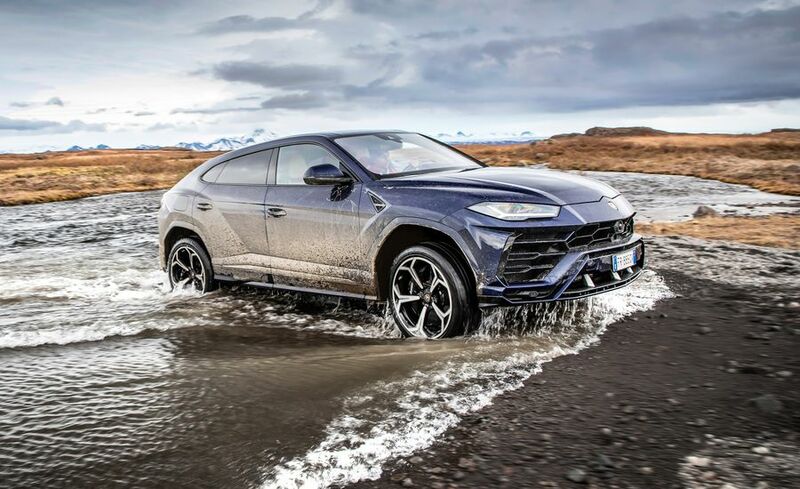 Iceland’s persistent soak kept us from trying the Urus’s launch control, but on dry terrain, the 5314-pound SUV tears to 60 in 3.2 seconds and vanquishes the quarter-mile in 11.4 seconds at 121 mph. We stop for the night at Hotel Gullfoss, minutes from the waterfall. After sundown, a desperate hope to glimpse the aurora borealis pulls us outside. But Gullfoss is a place so dark and silent that our atavistic faculties keep us near the warm security of the building. We feel small but sleep well. The next day, there are more dirt roads. Not Route 35, just other, lesser paths. And more mountains. There’s a sloppy climb that stops the Urus cold on our first two attempts, casting it sideways in a sluice of mud-snow that threatens to spit the multi­talented SUV off a steep slope cut deep with switchbacks. But we persist. Not like we would in a Raptor—all throttle happy, caution be damned. No, we’d move ahead more warily, full of the knowledge that, according to Lamborghini, this SUV can also lap the Nürburgring Nordschleife quicker than a Gallardo. And that it costs more than four Raptors. It punches over the crest with little drama on the third attempt. Shortly after that, the Urus successfully fords two rivers, the second of which offering sufficient depth to submerge its doorsills. Then the realization hits: Building a distinctly Italian SUV from a German pedigree might just be an unparalleled way to create the highest form of the genre, the ultimate SUV. In the Urus, there are unflappable German manners and an immense breadth of strengths, all of which are beset with a heavy flourish of Italian style and speed. And those things, in a place like this—or L.A., Pikes Peak, the Hamptons, or the Australian outback—are exactly what you need.